This is a report of a Sierra hike that began at at the Granite Creek trailhead, heading into the canyon of the North Fork of the San Joaquin River. I include some notes at the end for those who may be looking for information when planning a similar trip. For more information, see my favorite books on the Sierra Nevada. August 5: Having spent the night in Oakhurst, the three of us (Randy Bytwerk, Ed Van Beek, and Dan Vandersteen) left early for the trip up the Baysore Road, which curves a lot, and a good stretch of it is unpaved, so those heading to the trailheads should allow 90 minutes or so to get to the end of the road from Oakhurst. We reached the Minaret Pack Station by 7 a.m. I’ve used them before, and recommend them. I used to mutter about packers in my younger days, but now I find that taking the load away on the first day does wonders for my morale, and also enables me to hike in one day what would take two days with a pack. The packer told us it wasn’t a good year for business. We happened to be going in on a busy day, however.Our packer had been in the business for about forty years. I was amused that he carried a GPS device. North Fork of the San Joaquin River. It had been a dry winter, with snowfall about half of normal, and there had been no good water after leaving the trailhead, so reaching Hemlock Crossing was a relief. It has a lovely setting, with a pleasant waterfall and pool, and rapids above and below. I hadn’t expected to see many people, but there were two other parties at Hemlock that evening..
middle of the Sierra. They take a great deal of work to build, and don’t always survive Sierra winters. This one is at a point difficult to cross even at low water. I wouldn’t want to try in June. After setting up camp, we chatted with the neighbors (interesting, as usual), and Ed began a series of experiments with home-made alcohol stoves. He had five of them along. Since, however, they were all made of aluminum cans, the weight was negligible, and they all boiled water with surprising speed. Thre’s a website on the matter. Hemlock Crossing is low enough to allow campfires, so we collected sufficient wood and spend a pleasant evening enjoying the surroundings. August 6: Feeling in lively shape, up toward Twin Island Lake. There is a trail most of the way up, but it peters out after a while. The walking is lovely. I’d managed to enter inaccurate GPS coordinates, so I was surprised when we didn’t find a lake where I thought there should be one. It turned out to be a little higher. The afternoon was coming along, and Dan and I decided we’d done enough, so we waited while Ed scuttered up for a quick look at one of the lakes. There are bears in the area. As we were heading toward Iron Creek, we first saw a cub, then the mother looking down at us from about 150 feet above. She watched us for a while, then ambled off. We left the trail and cross-countried up Iron Creek for a while. The angle was fairly steep for most of it, making for pleasantly rushing water. August 8: Ed, a little more energetic than Dan or I, had already explored a bit of the west side of the river, and today, we headed up to see what we could see. The trail is on the east side of the river, but the cross-country going is easy, with no difficult stretches. One beautiful rapids or falls follows another. The water was low this year, but there was enough water coming down to make for pleasant meanderings. At the upper end, I decided to take it easy, so Dan and Ed went on a bit further while I enjoyed the scenery. As we headed back, Ed stayed on the west bank, but Dan and I decided to cross to the east side and take a little more direct a route. It didn’t turn out to be more direct, but the walking was pleasant. We were surprised to see some bright color ahead of us at one point, which turned out to be a cluster of deflated mylar balloons that had drifted in from who knows where. They didn’t look like they belonged, so we collected them. That night, we were startled by a group of eleven 11-14 year-olds and two adult leaders who came chugging in. Turns out they were from the San Diego area, members of an informal group that has been organizing hikes for years. They were on an ambitious trek from Reds Meadow to Yosemite. They immediately headed for the waterfall just above the bridge, which turns out to be a delightful waterslide. One sits in the indentation at the top, and away you go. Safe and exciting. I wish I’d known it earlier, since I’d have done it, but it was getting late, it was cooling off, and we were leaving the next day, so I didn’t get a change to try it out. August 9: The goal for the day was Cora Lake. Heading up the 1000 feet or so was a bit of an effort on a warm day, but after the usual effort, we were at Surprise Saddle. We dropped down the trail on the other side, and headed cross-country due west toward Chetwood Cabin, which we found without too much trouble. We then wandered about, finding the dry Lower Cora Lake, before heading toward a campsite on Middle Cora. I wouldn’t particularly recommend it. There are good camping sites, but the lake is shallow and warm. We’d planned on spending two nights there, but one seemed enough. It turned out Ed had never been to Yosemite, a tragic thing, so Dan and I proposed we head out a day early and visit Yosemite. August 10: After a quick hike out from Coral Lake, headed for Bass Lake, lunch and showers. We then headed for Yosemite, first stopping at Glacier Point. There were the usual crowds, always a shock after a period in the backcountry, but Yosemite is always a pleasure. We headed down to the Valley for a few hours after that, then headed toward San Francisco, the airport, and home. 1. There are three decent camping sites at Hemlock Crossing, two on the east side, one on the west. There is also a spectacular site with a great view of a waterfall about half a mile downstream from the bridge on the east side. 2. Those planing on heading up Blue Canyon from Hemlock Crossing can cross-country along the west side of the river without difficulty. Particularly at times of higher water, that would save crossing the North Fork, though this year there were a variety of comfortable crossings above the bridge at Hemlock Crossing for those taking the trail along the east side. After some more thinking, I’ve fixed on a new plan for the coming summer, with two options, depending on the weather and the bugs. The first option, and the one I prefer, is a remote and interesting area between the Minarets and the Yosemite Park boundary, part of the Ansel Adams Wilderness. We’d be packed in to Hemlock Crossing, at about 7,500 feet. From there, we’ll take a variety of interesting day hikes. The second option is to follow part of the route Dan Vandersteen and I took in 2005, but take a different route for most of the hike. This picture is from the 2005 trip. The preferred plan will take us to the area between the ridge in the center and the Minarets in the distance. I’d originally thought of going a week later than this plan shows, but the earlier week is better for those I heard from, and having a fallback plan allows for dealing with the weather. If it turns out to be a dry winter, we’ll do the first plan, since it involves lower-level camping in an area that will be buggy if wet. If it’s a heavy snow year,we’ll do the alternate, and higher, route. As of April 4, Sierra snowfall for the winter is at 33% of average for this date. It’s definitely a light snowfall year. You can look over the area on Google Earth. The coordinates for Twin Island Lake: N 37 41 339, W 119 14 001. The coordinates for Harriet Lake are: N 37 40 243, W 119 18 280. August 4: Fly from Grand Rapids to San Francisco. Drive to Oakhurst. August 5: We’ll need an early start to take the Baysore Road deep into the territory south of Yosemite. Dan and I went this way in 2005. The Minarets Pack Station will haul our packs to Hemlock Crossing, by reports a good place to camp. We’ll use it as a base camp for four nights. 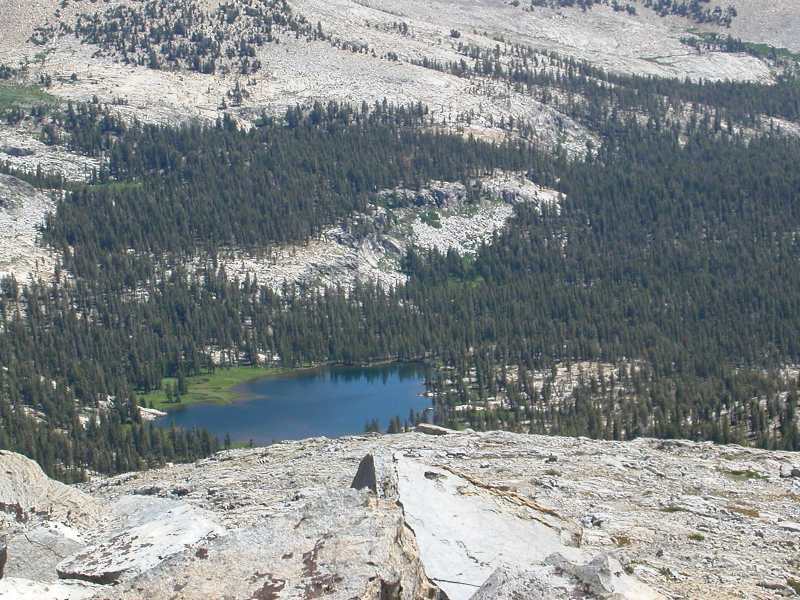 Alternate: We’ll be packed from the same trailhead (6970 ft.) to Sadler Lake (9362 ft.), where Dan and I camped in 2005. Night at Sadler Lake. August 6: Day hike to Twin Island Lakes (9659 ft.), and do some general exploring and scrambling about the area. Night at Hemlock Crossing. Alternate: Climb Sadler Peak (10,567 ft.), an easy climb from Sadler Lake. Night at Sadler Lake. August 7: Day hike to Bench Canyon and Blue Lake (10,528 ft.). Night at Hemlock Crossing. Alternate: Hike over Isberg Pass (10,480 ft.), then cross country to Harriet Lake (10,276 ft.). August 8: Poke around. Night at Hemlock Crossing. Alternate: Climb Foerster Peak (12,057 ft.). Night at Harriet Lake. August 9: Hike from Hemlock Crossing to Cora Lakes. Alternate: Explore the Harriet Lakes area with some cross-country hiking. Night at Harriet Lake. August 10: Explore Cora Lakes area Night at Cora Lakes. Alternate: Hike over Post Creek Pass (10,280 ft.). Detour from pass to top of Post Peak (11,009 ft.). Night around Porphyry Lake (10,150 ft.). August 11: Hike out, drive to airport. Celebratory dinner.